Is Warren Ellis a wizard who can predict the future? Can we learn anything from his 20-year-old vision of American politics? This is part one of X: Can a cult of personality be a President? 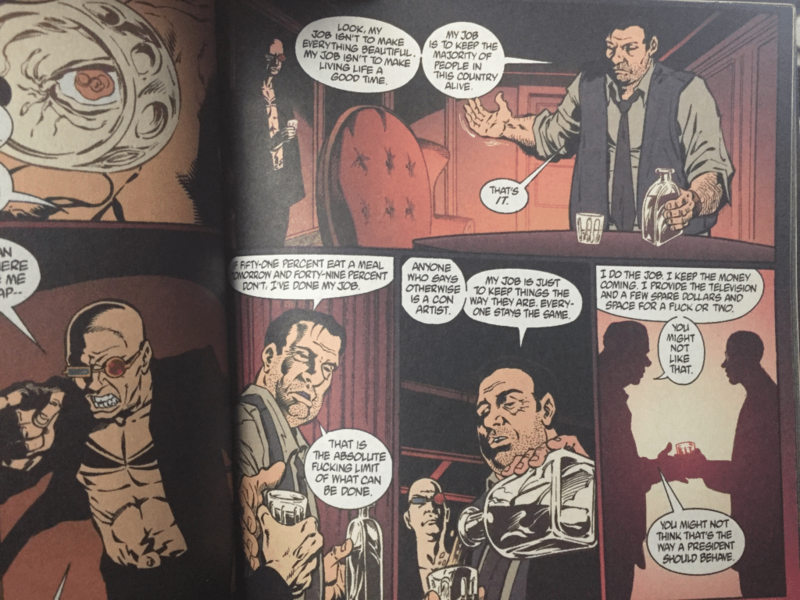 Warren Ellis’ 60-issue political epic was originally published between 1997-2002. The story follows Spider Jerusalem, a renegade journalist, in the style of Hunter S. Thompson, as he leaves retirement and covers two loathsome men in the running for the U.S. Presidency. The graphic series is set in a cyberpunk megacity, with aspects both alien and familiar: print journalism has evolved into feeds and aggregates, “powdered baby” is a totally okay food, and Republicans romp in an isolated sexual playground that’s broadcasted as a pre-scripted reality television show. Spider is framed as a righteous anti-hero. Drug-fueled and idealistic, he rampages through The City dispensing his mode of journalistic justice. He covers the stories that “normal people” don’t want to read, but his column serves as a hybrid of oped and investigative journalism. By vilifying the incumbent President (referred to only as The Beast), Spider accidentally allows for the rise of a fresh-faced candidate, Callahan, who turns out to be a vessel for political ambition and nothing else. Spider, infected with a neurological virus, fights to destroy the President he mistakenly created. The drama of the final act is whether the morals-driven journalist can unravel the strings of a corrupt politician before his brain becomes useless. When I pitched this essay, Ted Cruz had won a hard fight for delegates in the Wisconsin Republican primary. I declared to an empty room, “He has fewer total delegates, but I think he’ll stay in the race through the nominating convention for the sake of narrative drama.” Clearly, I am no prophet, and Cruz dropped out of the race in early May after several absurdist Hail Marys that yielded nothing but Donald Trump’s secure victory as the GOP Presidential nominee. Mired in controversy, but seemingly impervious to it, Trump is reimagining himself as a general election candidate, but has yet to land any punches on the moving target of the Democratic nomination. On the Democratic side, long-time Democratic operative and former First Lady/Secretary of State/New York Senator Hillary Clinton is still in a nominating race against long-time Democratic caucuser and formerly-Independent currently-Vermont Senator Bernie Sanders. Clinton is leveraging her political experience and her close relationships with people up and down the economic spectrum—from minority victims of the 2009 economic recession to the bankers who caused it. Sanders is showcasing a platform of optimism and idealism and is recommending immediate reforms to make sure the least advantaged Americans (such as victims of the 2009 economic recession) have more money and direct benefits from the government. Meanwhile, on the echo chamber of [any social network], supporters of [any political candidate] have endorsed their candidate’s policy ideas via social and physical abuse and also reposting memes. While this is not unique to the 2016 nominating process, it is exhausting: it’s a long road to the conventions in July, let alone American election day. 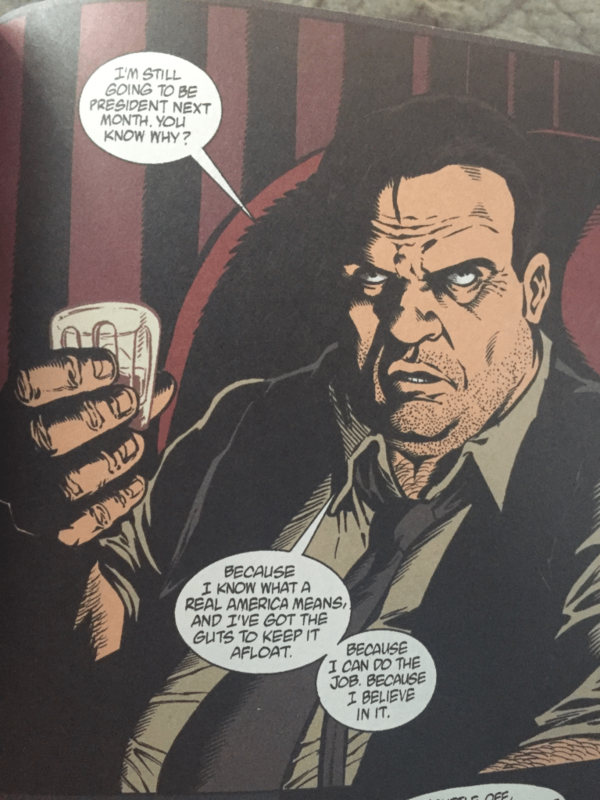 So here’s Warren Ellis’ first prophecy: a future-America nourished by a constant flow of news and entertainment will be bored by the Establishment candidates, politicians who understand the system and negotiate legislative change in increments. Thus, the populist appeal of Trump on the one hand and Sanders on the other. Trump’s border wall isn’t just policy proposal: it shows that he’s a candidate who wants to break the stagnation of U.S. job creation by limiting the immigrants allegedly stealing jobs. Sanders’ proposal to forgive student loans is a direct response to—you guessed it—the 2009 economic recession; he wants to create more jobs by helping college grads get to the kind of work they train for, not struggle to survive monthly debt payments. Both of these proposals are impossible, but it’s easy to see the broad appeal to their target demographics. On the one hand, an entrenched politician in an entrenched system. On the other, the possibility of forward momentum. If you play a collectible card game, such as Magic: the Gathering, Hearthstone, or Netrunner, you’ll hear this phrase whenever a new card/mechanic is added: “This changes the metagame.” The complaint usually means that a new, powerful strategy has been introduced, one that forces players to adopt the strategy or play specifically against it. Journalists have been busying themselves examining the rise of Trump, but the truth of the matter is that our media environment allowed him to change the metagame of politics. The strategy is simple: America, vulnerable and shaken after an economic crash, turns to a business-friendly strongman for reassurance that it can, in fact, be great again. For proof that Trump’s popularity is in response to a climate of economic insecurity, compare 2016 to his first abortive run in 2000, on the tail of an economically strong Clinton administration. Trump’s campaign worked under the banner of his new book The America We Deserve—again, with the dogwhistling that America isn’t good enough for Americans. With inflation low and the American surplus high, Trump’s campaign sank. Without a strawman antagonist threatening real Americans, there is no Trump or Heller. Spoiler alert: Callahan, a.k.a. 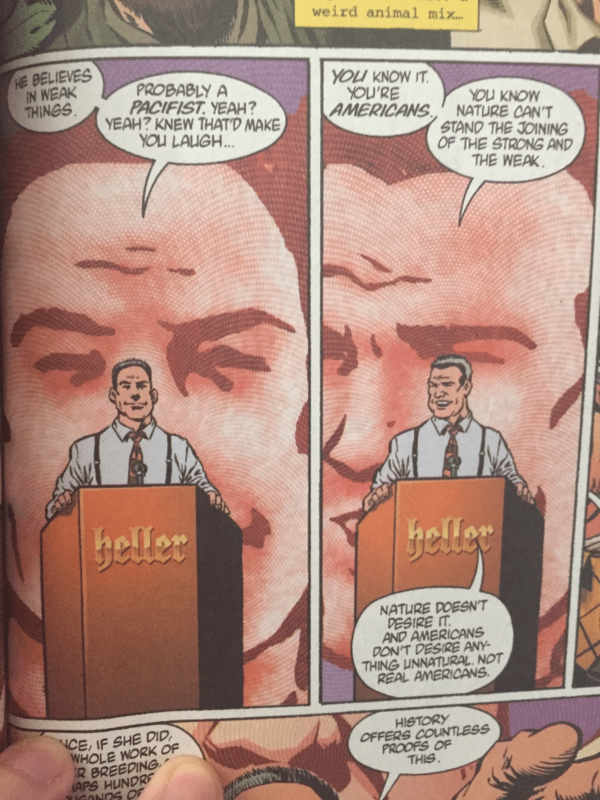 The Smiler, wins the election in Transmetropolitan and becomes the primary antagonist of the rest of the books. As a character, he is a blank template, waiting with reptilian stillness to brand himself with the issue du jour to win the Presidency for the sake of having the Presidency and no other reason. Like I said, I pitched this piece while Ted Cruz was still in the race. 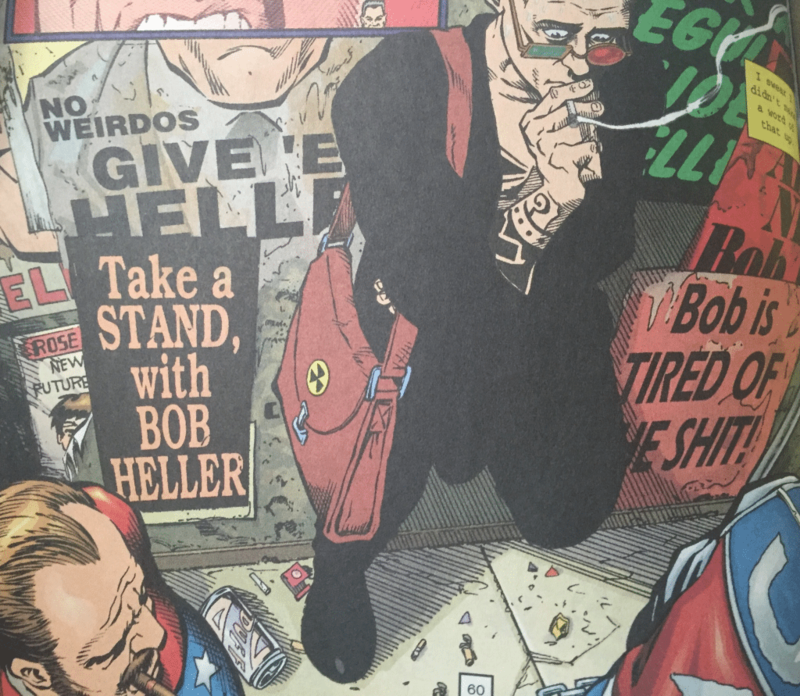 So what does Transmetropolitan say about the perfect candidate? What problems should this candidate fix? Although the comic is set in a far-future dystopia, The City’s problems are very close to home. Take, for instance, the excerpt from a Spider column below. The text would have been published over 15 years ago, but I’ve taken the liberty of adding citations for major news stories in the past three. Okay, I admit. I exchanged “asbestos” for the unknown melange of chemicals poisoning the water of Flint, Michigan and other underprivileged American towns—towns that only see infrastructural change when gerrymandered local governments can no longer ignore the widespread effects of systemic poverty and racism. 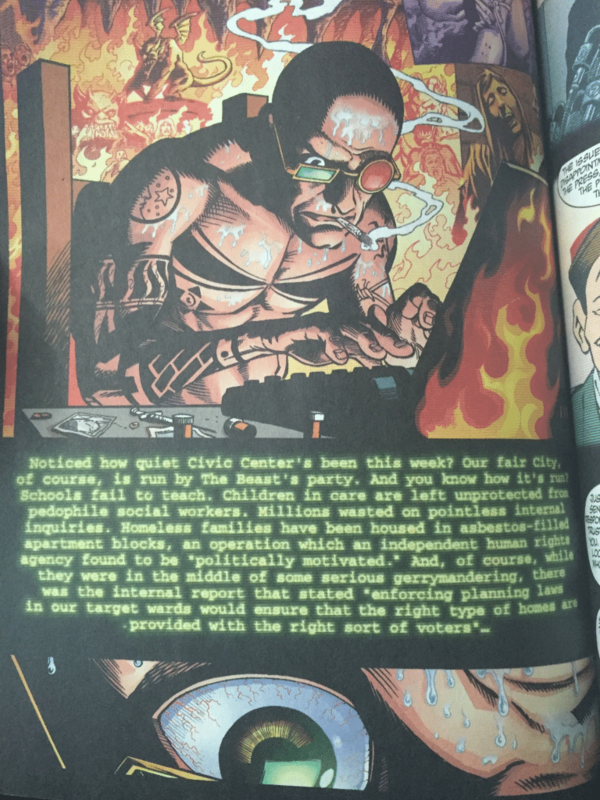 But my point is this: the voting public of Transmetropolitan is responding to the same crises of government that Americans are today. 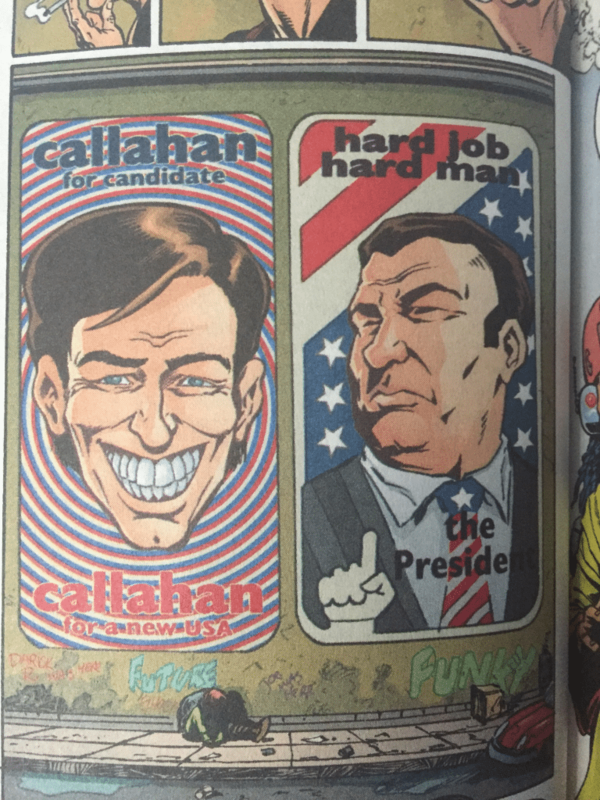 In Warren Ellis’ fictional universe, Spider tricks the populist candidate Callahan into revealing his thoughts about these people: “Spider Jerusalem speaks to a vast audience of losers, wannabes, white trash, hate addicts, children, and nerve damage cases. All of whom have votes. They are the new scum, Vita, and they’re the biggest voting block in this city” (Transmet, Book 3, page 45). What Callahan and all of the 2016 candidates share is a scorn for large swathes of American people, delegitimizing the institutional roadblocks that stop them from success. This dismissal manifests in Donald Trump’s description of Mexican immigrants (“criminals, drug dealers, rapists, etc.”), or in Bernie Sanders’ dismissal of the “deep South,” or in John Kasich (remember him?) and his tone-deaf comment about women “leaving their kitchens” to vote for him. And before the comments start pouring in, it’s true that finding an anti-unification quote for 2016 Hillary Clinton is difficult. But she’s had eight years to learn her lesson from 2008, when the Clinton campaign’s rhetoric was part of a pattern of dismissal that destroyed her support with African-Americans. 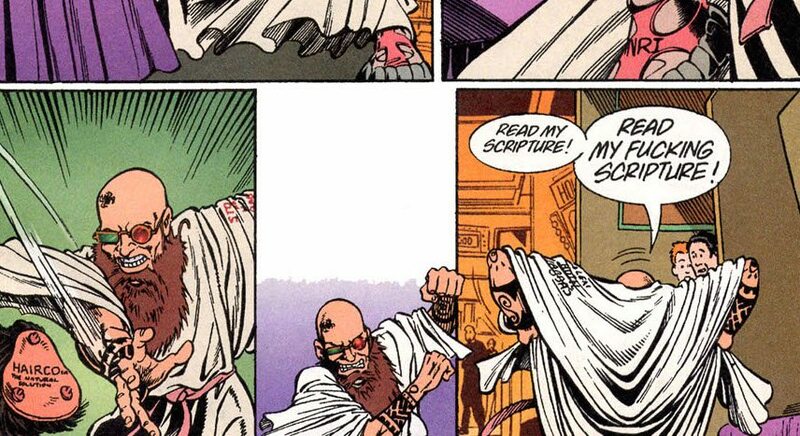 Transmetropolitan is a story about the triumph of enfranchisement. Youth protesters, transhumanist allies, and poverty-stricken slumdwellers don’t join forces, per se. But (under the rallying cry of Spider’s capital-J Journalism), they rise up independently to defend themselves against an ultra-militant police force. I think that’s the lesson we need to take from Transmet in the year 2016: fight for the issues, not the personalities. The U.S. is going to elect a new president this year. But the winners should be #BlackLivesMatter, the DREAM Act, PEPFAR funding, and us, the New Scum. Will Warren Ellis be prophetic in this too? I hope so.